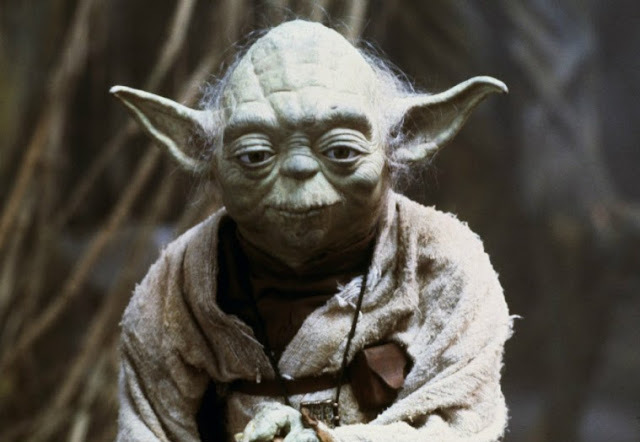 Yoda was the curious little green guy that turned out to be one of Star Wars most loved and quoted characters. Sure E.T. was arguably cuter and could also make things fly, but he didn’t have the power of the Force and a command of a certain kind of lexicon that was was as unique as has ever been in film history. That lexicon has meant many of Yoda's quotes and sayings have fallen into every day use by many Star Wars fans. Here's Yoda's best and funniest quotes from the 6 Star Wars films he appears in. That's right 6, as he has a sneaky cameo quote in The Force Awakens! Let's go straight to the most classic quote from ANY of the Star Wars movies, including the prequels in which Yoda had a lot to say about prophecies. From Empire, Yoda is explaining to a frazzled Luke Skywalker that in terms of using the Force to pull a sunken X-Wing from out of the swamp that he's in a pass or fail situation. And then to show his young learner who's really in charge, he does do the do and lifts the ship out himself. Yoda jests with Luke a little. Before he then dies. Yoda was quite fond of jesting his Jedi - remember this one? Yoda to the bearded Obi-Wan in Attack of the Clones. "Lost a planet, Master Obi-Wan has. How embarrassing. How embarrassing!" In the same scene Yoda also comments: "Truly wonderful, the mind of child is". If you recall that Anakin, now as Darth Vader murders Yoda's class of younglings in Revenge of the Sith this line retains a greater poignacy that may have been first intended. Old Ben and Yoda are having a wee Force chat about Luke and his chances of taking down Darth Vader. Obi-Wan laments his fears that 'they' have already lost. Yoda then curiously mentions that there is another Skywalker! This blew everyone's mind in Empire. It wasn't until Jedi that it was revealed that Princes Leia was Luke's sister. The prequel film Revenge of the Sith was used as an opportunity to demonstrate that Yoda has this knowledge, in the last scene that Obi Wan and Yoda had together when they were alive. Some say you can't teach an old dog new tricks. Yoda seemed to think Luke could. And he did. Believe it or not, Yoda also had a quote in The Force Awakens. In the 14th second of Ray's flash back / dream sequence both Yoda and Obi-Wan Kenobi have the briefest lines - as a disembodied voice, Yoda says "surrounds us… and binds us." This is, of course, Yoda talking about the Force. Yoda said it when he was sitting with the Jedi Council in the interview with young Anakin to determine whether he should be trained as a Jedi. This quote became a strong foreshadowing of what would troubles would befall young Anakin. The fear that ultimately brought Skywalker down, was the fear that his beloved Padme would die. This time round, Yoda would have had no doubt about the meaning and truth of his words. "The shroud of the Dark Side has fallen. Begun, the Clone Wars has." “Wisdom they held, but that library contained nothing that the girl Rey does not already possess.” - What a great trick from Yoda! You forgot the "matter your lightsaber size does not, how you use it will."